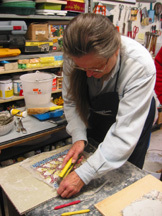 In January 2005, Sharon went to Ravenna, Italy for a short course in mosaic making. She was accompanied by daughter Diane and niece Julie. They had a great time and learned a lot. The first big project is a marble mosaic floor for an outdoor porch at Joe and Janet Julian's home in Las Vegas. After planning and assembling of materials and tools, work was started in August 2005. The mosaic was worked by reverse techniqe in vitreous glass tile. Very early 60's was this countertop for a patio console at our first home in Canoga Park -- broken ceramic tile and colored grout. When we lived in Idaho Falls, Idaho (1967-1969) there was a great workshop in the basement, so there were more mosaic projects, all done in vitreous glass tile. The three wise men was worked directly on plywood, with no grout. It is mounted on an 8-foot panel covered in red felt and it still graces the entry every Christmas season. Diane and Brian, ages 2 and 4, did the clothing and I did the faces and cut any tile the children needed to have cut. The geometric valence was in the family room in Idaho. 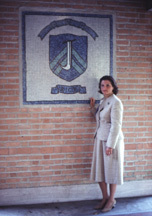 The tile are mounted on plexiglass, grouted, and framed in wood. There was a flourescent light behind the valence, so the pattern showed up well. The lower valence was a commission at a new house sited with a great panoramic view of the valley and distant buttes. The window looked out on that view and they did not want or need curtains, so the valence was the total window treatment.